For a description of efforts to reassure the faithful by locating the site of Paradise, see Notes for ID # 1014, Carte de la Situation du Paradise Terrestre, 1700. For other maps locating Eden from Iraq to China to Florida, see Subjects > Religion. 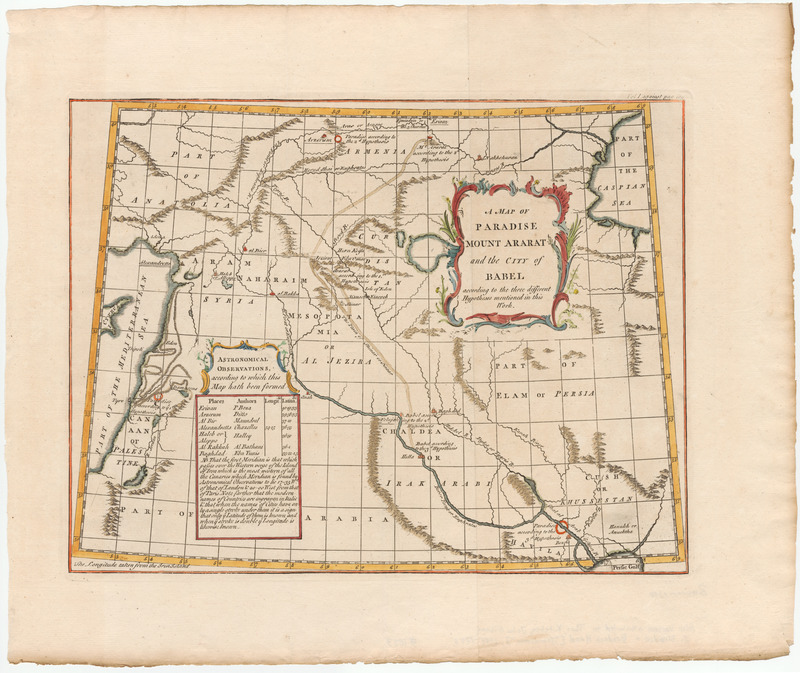 This map retreats from the attempt to provide certainty by offering the viewer "three different Hypotheses" for the location of Paradise: one in modern Israel, one in modern Turkey, and one in modern Iraq. It appeared in volume 1 of "An Universal History", first published in 1747 and reprinted throughout the 18th century. The authorship is a bit of a mystery. The map has variously been attributed to "J. Blundell," Emanuel Bowen or his son Thomas (which seems less likely, since he was only 14 when the map was first published), John Gibson, or Thomas Kitchin. French, Tooley's Dictionary of Mapmakers, 3:229, attributes the maps in "An Universal History" to "John Green," the pseudonym used by Bradock Mead, and the Osher Map Library has said that this particular map "certainly . . . has all the hallmarks of Green's work." http://www.oshermaps.org/special-map-exhibits/percy-map/john-green, accessed November 18, 2014. Green hid his identify as a result of repeated legal difficulties, including imprisonment for his role in the kidnapping of an heiress. Ibid. On the various mapmakers, see generally French 1999-2004. Sale, George, & others. 1747 or later. An Universal History, from the Earliest Account of Time. Compiled from Original Authors|and Illustrated with Maps, Cuts, Notes, &c., vol. 1. London: T. Osborne.